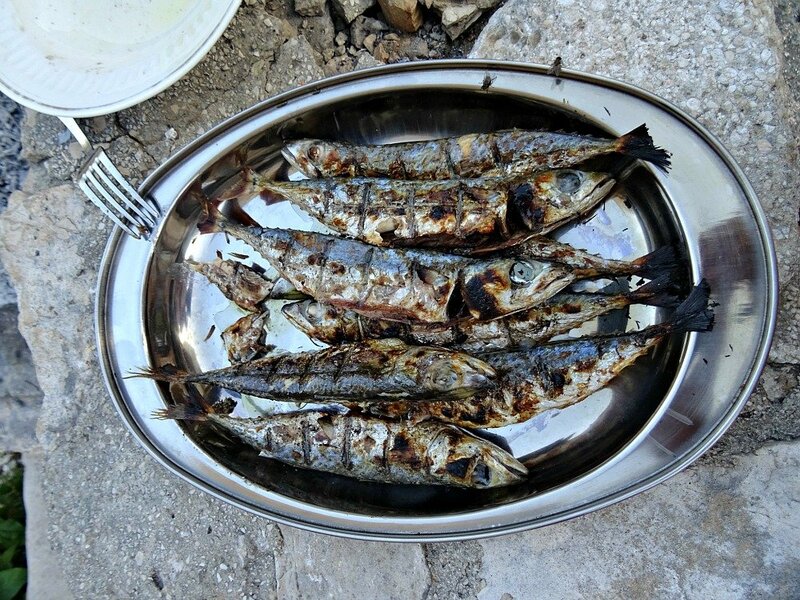 What to serve with grilled blue fish. 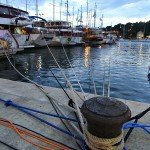 On the Island of Vis Croatia we embraced a life of simplicity. 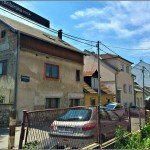 Our Airbnb host Jaško grew tomatoes, herbs and zucchini in his vegetable plot and welcomed us with a bag of lemons fresh from the tree. Another day we were presented with a plate of fritters, made from a zucchini which had grown into a plump 30cm long monster. We learned that these huge zucchinis make the best fritters. 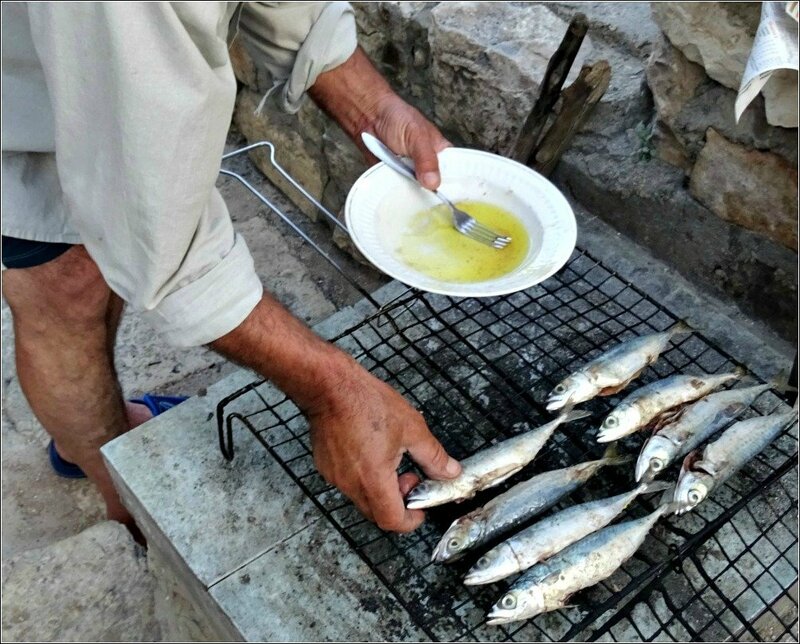 Jaško wanted to show us how to grill Blue fish, a small breed of Mackerel not found in Australia. The whole process was simplicity itself. If you ever get a chance to try these taste bombs, then grab it with both hands. 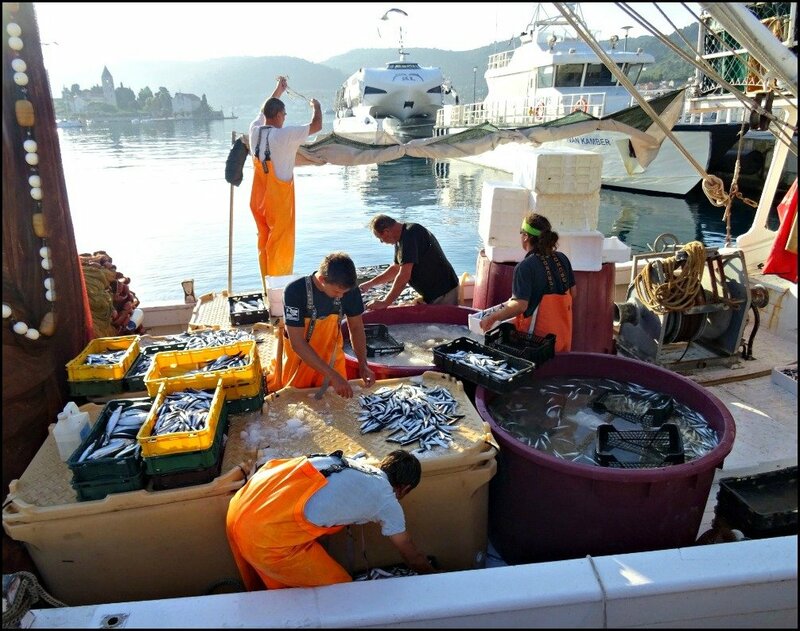 The fishing boats tie up down in the port with beautifully fresh fish. There is a fish market nearby. Grape vine trimmings and newspaper produce a fire which burns down quickly. I’m fairly certain the vines add flavour to the fish as well. Use home made olive oil of course. 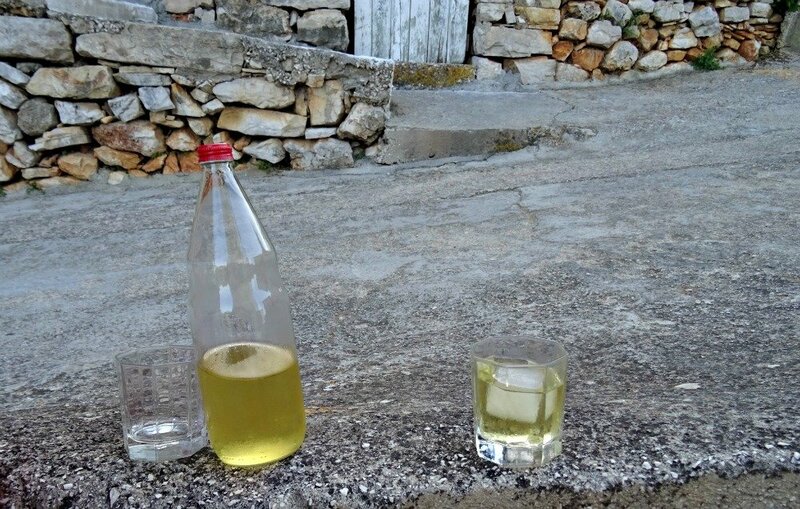 Home made wine – the perfect accompaniment. Rake the glowing embers into a shape ready to receive the grill. The grill legs keep the fish the correct distance above the coals. Flip the grill and within minutes juices sizzle and an out of this world good smell fills the air. Place fish on Serving Platter and drizzle with extra olive oil. Our favourite fish meal from our Ten Weeks in Europe 2015. 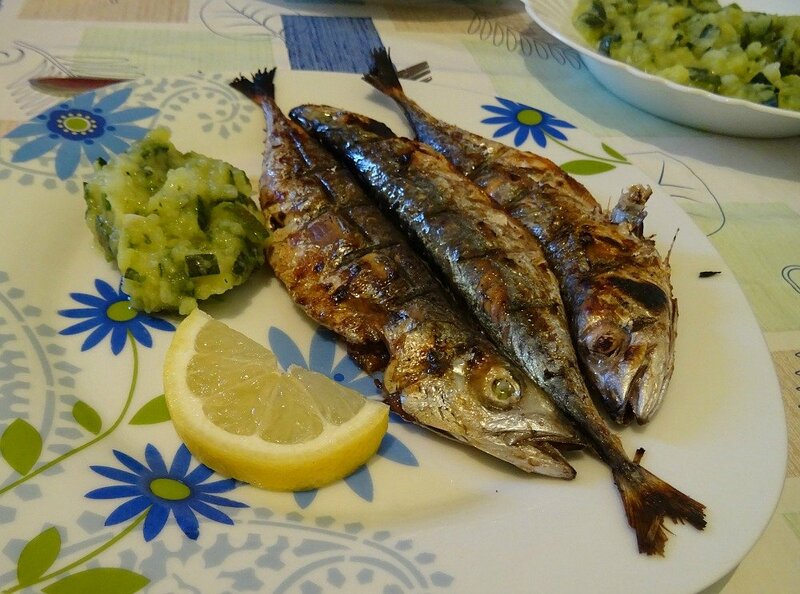 It is astounding how well a simple side dish of cooked roughly mashed potato, zucchini, olive oil and garlic, served at warm room temperature compliments the grilled fish. 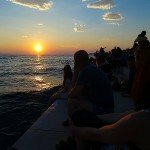 Surely one of the easiest and best Croatian recipes? At home in Queensland we don’t usually eat fish like this, but after tasting them on our Vis Island grill we were hooked. 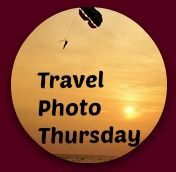 This week I’m linking to Nancie’s Travel Photo Thursday at Budget Travelers Sandbox with co-hosts Ruth from Tanama Tales and Rachel from Rachel’s Ruminations. WHAT IS YOUR FAVOURITE MEAL EXPERIENCE WHEN TRAVELLING AND WHAT WILL YOUR CHRISTMAS BE LIKE? MERRY CHRISTMAS. 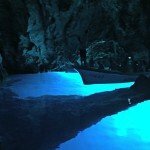 THIS WEEK I’VE ALSO LINKED TO CORINNE AND JIM’S WEEKEND TRAVEL INSPIRATION AT REFLECTIONS ENROUTE. They say the simple things in life are the best and that definitely applies to food! The fish looked delicious!! Yep it was so tasty – amazing. Merry Christmas! Those fish look perfect! I don’t do Christmas, and neither does my husband really, but he always cooks us “wild” on Christmas Day. Here in the Netherlands, that’s the tradition: you eat anything wild-caught. Some years he cooks hare, but this year it’s venison. We’ll see how that comes out! Wow Rachel, the Netherlands has some different traditions. I’ve never heard of the wild-caught theme for Christmas. I guess fish is wild caught so it could be on the menu too! 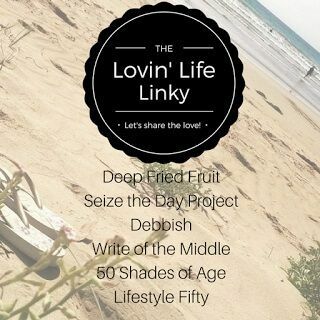 Your minimalist holiday with your friends sounds so nice, Jan. 🙂 And these fish tidbits sound absolutely marvelous. 🙂 Hope you have a gorgeous feast and fun time with your family this year! Those little fish look tasty! Grilled fresh fish are almost always a good bet. Happy holidays! Thanks for dropping by Jessica. I loved reading about you wedding on the high seas. While I love the idea of cooking with freshly grown foods and grilling fresh fish, I’m still thinking of your 3 metre pool and the marquee. In Jamaica, Christmas Day is for food, family and friends. Boxing Day is for the beach. A belated Merry Christmas to you and your family, Jan, and the very best for the New Year. Yum, that fish looks delicious, and I can almost smell them cooking. I hope you had a Merry Christmas. It was unseasonably warm in Texas and felt like summertime. It had us wondering if Australians ever dream of a White Christmas. Your celebration sounds like fun. We spent three days visiting various families and friends — 7 different meetups in all. Michele that is a huge Christmas – 7 meetups – that would do me in! Definitely Aussies do dream of a White Christmas. We are raised on Christmas Cards and images that involve snow. I guess a lot of Aussies have given themselves that dream at least once in their lives, but we have not YET! We’ve seen snow, but we’re always home at Christmas. We have a dream to be in NYC in the Christmas season but I might be sad to be by ourselves on the actual day. Indeed, the homemade wine looks like a perfect accompaniment for the grilled fish and vegetables. Back to Australia — I’ve often wondered what Christmas in a hot climate would be like. I think I’d like to find out and spend some time in the pool. A hot Christmas is all I’ve ever known Cathy. Sometimes it is wet because traditionally Christmas is in the wet season in North Queensland. It’s always on the cards! Townsville is in a rain shadow so we don’t always get rain at Christmas. My mouth is watering Jan. You have so many interesting tales to tell. They have a very healthy diet don’t they. All that fish, olive oil and fresh vegetables. P.S. I’ve finally subscribed via email because I never see your posts on FB so now I won’t always be so late to the party. Hope you had a great NY. Yay – another follower – that’s three now lol. Yep Facebook is not showing us the love, and yes Croatians love seafood and olive oil – and wine. Jan, Yum! 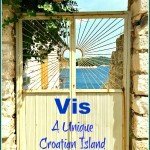 I am planning another visit to Croatia and this time I definitely think I’ll be heading to Vis. That fish is calling my name! I love that Christmas in Australia is a day to get outside, go to the beach and barbecue. Takes the focus off of just buying and giving presents and turns it into more of a family-togetherness day. We still have lots of hype over buying Christmas presents here in Oz, Eileen, but thankfully our kids are grown now and the pressure is off!